Experts play excellent supporting roles, providing technical help and judgements based on specific training. Respect their value as one resource to draw on, while recognizing that ultimately as stakeholders we must empower ourselves, relying on our own experience, values, and commitments to deliberate and make decisions on the issues that affect us. Context: While professional experts have much to offer complex problem-solving, policy-making, visioning and strategic planning endeavors, their contributions tend to be privileged over the perspectives of ordinary group members, or the knowledge of institutional or community stakeholders local to the issues or initiatives at hand. One important dimension of this pattern is to make sure to carefully consider concrete specifics and experiential wisdom emerging from immediate engagement with and knowledge of a place, situation or context that might surface as anecdotal stories or other forms of knowing traditionally discounted by experts (or those who rely on experts). These broader sources of relevant information can then inform deliberations, alongside the more generalized and abstract principles that experts tend to bring to the table. Keeping in mind that experts are a resource, reminds all players that experts are one resource, not the only resource, and encourages a broader search for and openness to a wide range of useful data and judgments. A second significant dimension this pattern pays attention to is clarifying the nature of the questions, issues and decisions under consideration, which may or may not be a good match with expert's knowledge and skills. For example, situations may call for technical information or judgments that an expert's training uniquely qualifies her/him to provide. However, many situations also require choices based on priorities, values, trade-offs and a willingness to assume risks, which typically fall outside the scope of experts' professional purview. This pattern suggests that these latter kinds of assessments and choices are best made by local stakeholders-- the people whose lives/work will be directly affected by the decisions made. The intent of this pattern is not to diminish the value of expert knowledge, but to shift the role of experts away from that of formal decision-makers, and place their professional judgments in appropriate relationship with other forms/sources of knowledge as one factor in a multifaceted process that must weigh technical information along with values and trade-offs as difficult choices are made. A number of authors speak to the need for such a realignment. For example, Carl Moore writes "...complex human problems cannot be solved by rationale thought alone. Experts do not know enough, can never know enough, and, ultimately are not responsible for the outcomes that follow from their advice. It is the people with the problems who must determine what solution is right for them. They can benefit from expert advice, of course, but that is an insufficient basis for making decisions. [insert reference here]." In summary, experts should not themselves be determining the issues and prioritizing, but advising those who do by being available as a resource. Instructions: If you are planning a deliberation and decision-making process where expert knowledge will be valuable, invite experts to be available to provide testimony, summarize relevant data and offer their judgments-- but do not include them as primary decision-makers. 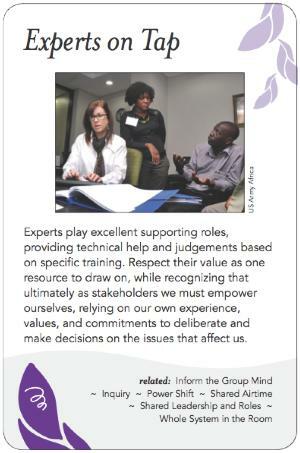 Also design in ways for all stakeholders to contribute their relevant knowledge, and empower participants to step into roles as framers of issues, questioners of the experts, and ultimate decision-makers. Classical peer review: an empty gun by Richard Smith. Well-reasoned article on the flaws of peer review as a system.